Cast Iron Skillet Naan - What the Forks for Dinner? 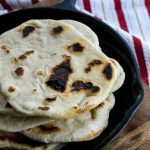 Cast Iron Skillet Naan - What the Forks for Dinner? In a large bowl, add the sugar, warm water, and yeast together. Stir to combine well. The yeast will become foamy and activated after about 10 minutes. Mix yogurt and oil into yeast mixture, then add flour (about 1/2 a cup at a time) and stir to combine. Transfer the dough to a flat surface and knead the dough until the surface becomes smooth and shiny about 10 minutes. Cover the dough with a damp cloth and let it rise in a warm place for about 1 hour. Divide the dough into 8 equal portions, then roll the dough into 8-inch circles. Don’t worry if they are not perfect circles. Heat a cast iron skillet over high heat and lightly grease the surface with oil to avoid the dough from sticking to the skillet. Place circles in skillet one at a time. When the circle begins to puff up, and bubble and burnt spots start to appear, flip it over and cook the other side. Repeat with remaining dough. Brush the naan with the melted butter, serve warm.